Accessory Geeks, online at AccessoryGeeks.com, is your one-stop accessory shop for all your electronic devices. Accessory Geeks offers mobile phone cases, chargers, batteries, cables, antennas, charms, and headsets, for brands such as LG, Nokia, Samsung, Motorola, Palm, Blackberry, and more. Additionally, Accessory Geeks carries accessories for any type of iPod, Kindle, Nintendo DS, and laptop. Accessory Geeks really does have everything you need to manage the technological devices in your life. Check it out -- but check out RetailSteal.com first for Accessory Geeks discounts, Accessory Geeks coupons, and Accessory Geeks promo codes. Accessory Geeks offers free USPS First Class Shipping to US and Canada for any customer. Select additional shipping methods for extra charge. Check website for full details, exclusions may apply. Head over to Accessory Geeks today and use our coupon code to save $15 on your purchase $75+. Save $15 on your custom case purchase when you shop online at Accessory Geeks and use this promotional code with your purchase! Shop online at AccessoryGeeks.com and use coupon code to save $10 on your purchase $50+. Enjoy a $5 discount on your custom case when you use our coupon code online at Accessory Geeks. Enjoy up to 80% savings on iPhone 5 cases from Accessory Geeks. Click to shop. Get up to 60% off Accessory Bundles at AccessoryGeeks.com. Click to buy. 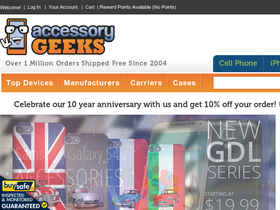 Receive a 4% discount on purchases from Accessory Geeks online when you use our coupon code online today. Click our link to shop now. Use our coupon code at Accessory Geeks online today to save 15% on Samsung Galaxy S4 cases. Save 27% at Accessory Geeks on all cases $12.99 or less when you use this promotional code at checkout! Use our coupon code at BodyGuardz online today to receive a 30% discount on purchases. Save 10% on your BodyGuardz purchase and receive free shipping when you use this promo code! Spend $100 or more on your order from Body Guard and use this coupon code to save $10. Click to save. Use this coupon code on BodyGuardz to get a 10% discount. Click link.